Parents, want to help your children reduce stress while promoting their success? 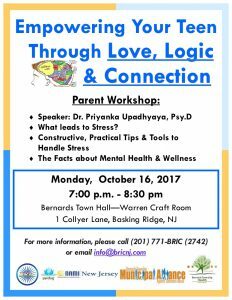 Come to this workshop led by Dr. Priyanka Upadhyaya, PsyD, who will share facts about mental health while also giving you practical tools to help your children handle stress. The event will be held at the Bernards Town Hall in the Warren Craft Room and is open all those interested in attending.